Airborne today and heading to Beantown for a fund raiser function and a studio visit to Magdalena Campos-Pons. Wanna go to a Halloween Show in Alexandria tonite? 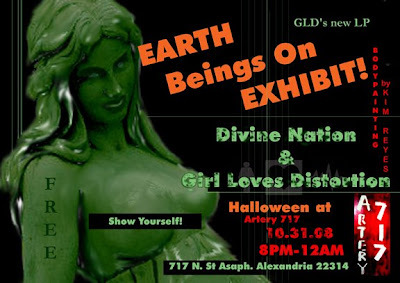 ARTery 717 in Alexandria, VA is having a Halloween show today Friday entitled “EARTH Beings on Exhibit,” with live music, bodypainting, fire dancers, etc. Their last show “Voces de la Tierra” is still up in the front galleries and I hear that it is quite remarkable. Artery 717 is at 717 N. St. Asaph St., Alexandria, VA. 22314. From 8-12PM tonite! DC's Project 4 gallery has a new abode at 1353 U Street NW, 3rd floor and their next show and first there will be a solo exhibition of work by Los Angeles-based artist Thomas Müller. The Opening Reception is Saturday, November 8, 6:00 - 9:00 pm and there's an Artist talk earlier on Saturday, November 8, at 4:00 pm.